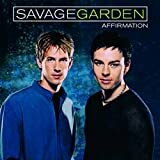 Savage Garden's, "To The Moon And Back"
Mother never loved her much. Daddy never keeps in touch. That's why she shies away from human affection. she packs her bag for outer space. And now she's waiting for the right kind of pilot to come. The song is about a girl who decides to run away from her problems.